India continues on its renewable energy commitment with measurable progress around the solar and wind industries. While solar has clearly stolen the first spot, wind energy is following closely. According to the Indian Wind Turbine Manufacturers Association (IWTMA), the Indian wind industry is expected to meet the 60 GW target ahead of earlier 2022 deadline. The Indian wind industry witnessed its biggest transition from the comfortable feed-in-tariffs to aggressive reverse auction bidding, which led to a volume drop during the last year. India saw a fall in new windmill installations between April 2017 and March 2018. 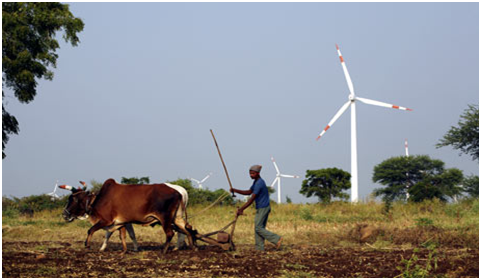 The government’s extra focus on the solar sector also neglected the wind energy market growth in India. However, the industry has started to gain momentum due to aggressive auctions by SECI and Indian states like Tamil Nadu, Gujarat and Maharashtra recently. The MNRE has committed to auctioning projects worth 10 GW in 2018 and another 10 GW in 2019. India is expected to see bids around 10-12 GW each year, taking the cumulative capacity to over 60 GW by FY21. Currently, India has more than 30 GW of wind energy installations. With India, further raising its 2022 renewable energy target to 227 GW from the earlier target of 175 GW, the wind energy installation target went up to 80 GW. According to IWTMA, investments worth INR 3 lakh crore would be required to achieve the additional targets. Tulsi Tanti, Chairman and Managing Director, Suzlon Group believes India could develop a wind export economy of more than 5 GW by 2022. India has a mature wind market with huge cost competitiveness and technology advantage. India also called for expression of interest for the first offshore wind auctions earlier in May this year. The situation of reverse auction bidding is not unique to India. In fact, countries around the world have adopted the aggressive bidding to bring more transparency and competitiveness to the global wind energy markets. This has led to the development of better technology and innovations. These innovations and competition would further lead to price drops and could hit the viability of projects and profitability for companies. Currently, Suzlon, Inox Wind, Wind World and Regen Powertech are the leading wind energy companies in India. These companies are facing tough competition from their Chinese peers and finding a tough going financially.